NOTICE: Activation key must be used on a valid Steam account. 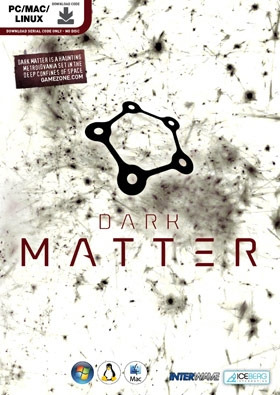 Requires internet connection.ABOUT THE GAMEDark Matter is a 2.5D side-scrolling survival horror game, set in a derelict spaceship besieged by a sinister alien presence, and infested with deadly parasites. As the Ensign, you must explore fetid hallways and abandoned facilities, scavenging for parts and blueprints, expanding your arsenal … to up to four deadly weapons and freely customize each to fit your combat style against intelligent, reactive enemies. Dark Matter delivers a hard-hitting take on the survival horror genre in deep space, with a heavy emphasis on tactical combat and exploration.Story:Out of breath, you run into the door, slamming against its cold metal surface. The clicking of scuttling claws recedes into the distance, swallowed by the pitch black oblivion behind you. You know better than to feel safe. There are too many infested at your back, and another blank metal door ahead. With a quick reflex you check your ammo supplies, and slot a fresh magazine into your shotgun. With a quicker prayer, you flick the switch and open the door. The metal jaws open on endless night you don’t dare pierce with your flashlight, not to disturb those things that live in shadow. By the pale bioluminescence that washes up from the floor grates, you piece together the picture of a corridor, and what could be a stretch of exploding pods. Just beyond, the silhouette of a fully grown crawler stirs. Grinning in the dark, you turn on the weapon’s flashlight, and point it straight down the corridor. Predictably, the blisters swell up to full irritation, ready to explode at the slightest touch. The crawler turns to hiss at you, instantly aroused by the light, and your presence. In your mind’s eye, it dumbly rushes forward into the blister pods to kill itself, saving you precious ammo. It takes a precious moment to adjust to reality when the sleek shape crouches and jumps towards you instead. There is time for just one panicked shot before the inevitable flight, as you run for your life, barely keeping ahead of the claws slashing for you. In a moment of adrenaline-fuelled inspiration, you slam the wall panel as you retreat past the chamber’s door. The heavy, powerful mechanism smoothly slices the crawler in half just before the critter can reach and disembowel you. There is no time to congratulate yourself, as you hear a familiar hissing from above...KEY FEATURES 14 levels in a gritty tale of deep space survival 4 weapons, each with 4 ammo types. Elemental ammo effects that allow you to freeze, dissolve, electrocute or set fire to your enemies. Four craftable upgrades to customize your weapons. Collect scrap and alien resources to craft your own tools and health packs. Invest in the weapons and upgrades you prefer, develop your own combat techniques. Non-linear exploration and storytelling with complex enemy AI that reacts to the player’s actions and tactics. Light and darkness are integral parts of gameplay, not just visual touches. Uncompromisingly real-time lights and shadow casting for spine-tingling moments of pure, darkness-fuelled terror. Clean, hand-painted textures and custom shading techniques are combined in a unique visual style. Dynamic soundtrack that adapts to gameplay circumstances. SteamCloud support and Steam Achievements Dark Matter will fully embrace Steamplay for Windows, OSX and Linux SYSTEM REQUIREMENTS Processor: Intel Core Duo Processor (2.4GHz or better) Memory: 2GB Graphics: Shader Model 3.0 compatible videocard, 256 MB NVidia or ATI graphics card Hard Drive: 2GB OS: PC: Windows XP or later Mac: OS X 10.5 or later Linux: Linux Ubuntu 10.04 or later Dark Matter © Interwave Studios 2013. Dark Matter logo, Interwave Studios and the Interwave Studios logo are trademarks or registered trademarks of Interwave Studios. Licensed exclusively to and published by Iceberg InteractiveB.V. for Europe. Iceberg Interactive design and mark are registered trademarks of Iceberg Interactive B.V. Developed by Interwave Studios. Microsoft®, Windows® and DirectX® are registered trademarks of Microsoft Corporation. ValveCorporation. Steam, Steamworks and the Steamworks logo are trademarks and/or registered trademarks of Valve Corporation in the U.S. and/or other countries. All other trademarks including, without limitation, the names of actualcompanies and products mentioned herein, are the property of their respective owners. All rights reserved. Made in EU.